Santi Santamaria, que decanses en paz. 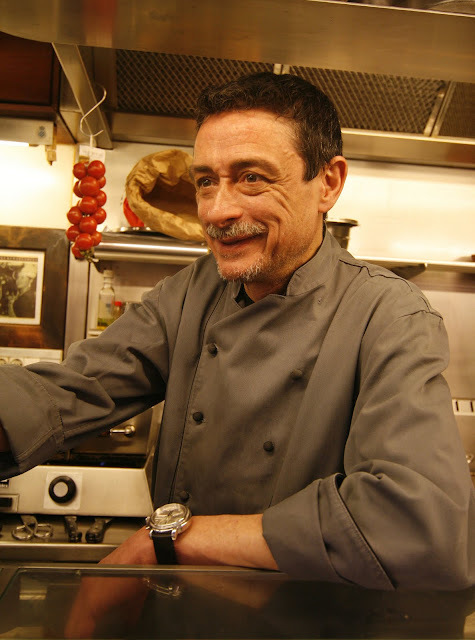 Sadly, three-star Catalan chef Santi Santamaría and two other Catalan friends of mine, Pinotxo's Albert Asín and Boquería Owner’s Association President Manel Ripol all died around this time in 2011. I still miss all of them very much. Hard to believe that they have been gone for five years. La Boquería market in Barcelona. manned the stoves at Pinotxo in La Boquería, Barcelona. This is from my article in Food Arts about Santi Santamaría sudden death on Feb. 16, 2011. The next day each of the star chefs served samples of their food to groups of the invited journalists. Santamaría’s dishes included the traditional pan tumaca, Catalan bread spread with a combination of Spanish extra virgen olive oil and raw garlic, rubbed with fresh tomato and topped with paper-thin slice of Ibérico ham. According to Cristino Álvarez, Santamaría was in the dining room and asked him if he would like to see the kitchen. Santamaría whose corpulent figure was more than ample evidence of his well-documented love of eating, had just finished eating a piece of pan tumaca. Ironically this quintessentially Catalan dish would be the last morsel of food ever savored by Santamaría–a traditionalist from inland, mountainous Montseny region of Catalunya--whose modern dishes were always designed to incorporate his insistence on Catalan roots, even though the techniques and twists he put on the dishes were often unmistakably French, influenced his the large collection of cookery books from France. The self-taught Santamaría was an exceptionally talented, albeit exceptionally controversial chef. His flagship establishment at the time of his death is El Racó de Can Fabes, in the village of San Celoni (near Barcelona). Santamaría, who like his father and grandfather was born in the house that became his restaurant, then hotel. He left his studies as an industrial engineer, opened a bar, then a Catalan bistro here, serving such dishes as pan amb tomaquet (the tomato bread, his last bite), botifarra amb mongetes (beans with Catalan sausage), before El Racó de Can Fabes, with Santamaría manning the kitchen, evolved into the first Catalan restaurant to earn three Michelin rosettes (in 1994; his first came in 1989). He went on to open successful restaurants in Barcelona and Madrid through his association with Hesperia hotel group. Santamaría’s feuds with Spain’s cocina de vanguardia chefs, especially Ferran Adriá, over their use of commercial food industry enhancements to their food made headlines in Europe and turned Santamaria into a pariah among his Spanish peers and Spain’s gastronomy writers. In spite of the ostracism, he earned a total of seven Michelin rosettes (the most held by any chef from Spain), including two for his San Celoni restaurant in Madrid and he also opened restaurants in Asia at Dubai’s Atlantis Hotel and in Singapore the eponymous Santi, run by his daughter, Regina, who was with him when he died. Santamaria also wrote 10 books on cooking and was awarded Spain's National Gastronomy Prize in 2009. Fellow three-star chef, Guy Savoy said “Santi left us for too early, but to take leave of us in his kitchen was a beautiful way to go." To all three of these sadly missed great culinary lights.